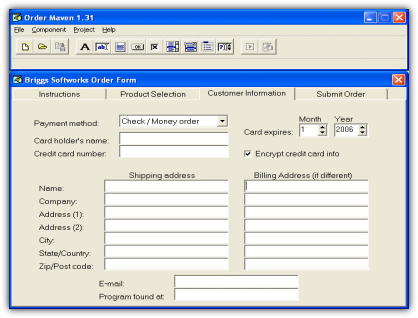 Order Maven ™ is a free order form creation program for online merchants. Produce standalone Windows EXE programs that customers can download and run from your site. With a few button clicks, products are selected, payment information is automatically secured with the built-in public key encryption function, and the data is then emailed directly back to you for processing. Exe format (omav.exe, 852 KB). Download and run to start the installation. Frequently Asked Questions - A FAQ file for Order Maven is available here.